By all accounts, the venture capital (VC) space in India is in the throes of a slowdown, starving startups of funds. But at a time when even angel and seed investors are turning cautious, venture debt could turn out to be the proverbial knight in shining armour for early-stage companies. The seeds for venture debt financing were sown in India in 2008, when Silicon Valley Bank India Finance Pvt. Ltd (now InnoVen Capital India Pvt. Ltd) set up shop in the country. That was also the year Facebook raised $100 million to build infrastructure. Since then, the venture debt segment appears to have grown, even though it remains small when compared to the overall VC industry in the country. Venture debt is a derivative of the VC industry, and so its fortunes are inextricably tied to the growth prospects of the latter. But the fact that the former comprises just about 2-4% of the VC market in India, means there is enough room for growth, according to several industry executives that VCCircle spoke to. Vinod Murali, managing director at InnoVen Capital, the largest of the three most active venture debt firms in India, feels that the low penetration levels of venture debt in India would mean there is still enough scope to grow. Venture debt, says Murali, is "intended to make the strong stronger". Industry executives say that in mature markets like the US, venture debt makes up for anywhere between 10-15% of the VC market on an annual basis. "In the US, the total venture capital market is of the order of $50 billion, out of which about $6 billion is venture debt," says Rahul Khanna, managing partner at Trifecta Capital. "Typically venture debt comes from three sources--specialised banks, publicly listed funds and private vehicles, which are mainly closed-end funds," he adds. Another factor that seems to be going in favour of venture debt is the fact that raising cash via this route is still cheaper than going to non-banking financial companies (NBFCs). Khanna says that, while NBFCs charge anywhere between 18% and 20% as interest, venture debt firms lend at 15-16%. However, venture debt funds lend only to those startups that are able to raise incremental equity. "We are happy to take execution bets, but we are not happy to take concept bets," says Khanna. Apart from Mumbai-based InnoVen Capital and IntelleGrow Finance, Delhi's Trifecta Capital Advisors, Bangalore-based Capital Float, IFMR Capital of Chennai and Ahmedabad-based Lendingkart are among a growing number of companies that offer debt funding to early-stage companies. And their tribe appears to be growing. Industry practitioners say that even mainstream lenders such as Kotak Mahindra Bank and Axis Bank are eyeing this segment, although there is little evidence if they have made any bets yet. VCCEdge data, however, show that at least one bank, DBS Bank Ltd, appears to have opened its account earlier this year. Earlier this year, VCCircle had reported that the state-run Small Industries Development Bank of India (SIDBI) is also active in this segment. While exact data needed to map the venture debt market in India is hard to come by, figures available with VCCEdge, the data research arm of News Corp VCCircle, indicate that the segment has seen a multifold rise in the past eight years, although from a small base. VCCEdge data show that while in 2008 only one venture debt financing deal was reported, by 2013 the number had peaked to 18. In value terms, the number has zoomed from less than $0.5 million in 2008 to around $28 million five years hence. The last two years, however, have seen a slight cooling off in the deal activity. To be sure, lenders like InnoVen do not make all their deals public, so the numbers may not be entirely indicative of the size of the industry. Several executives who spoke to VCCircle for this report cited significantly higher numbers of deals inked individually by them. "In the last month alone we have done 14 deals, and since April, we have clocked 72," says Nitin Agarwal, deputy chief executive officer at IntelleGrow Finance Pvt. Ltd. While Agarwal, who is focussed on manufacturing startups, says that his average lending ticket size is of the order of Rs 2 crore, other executives say they normally lend anywhere between Rs 3 crore and Rs 35 crore for two to three years. 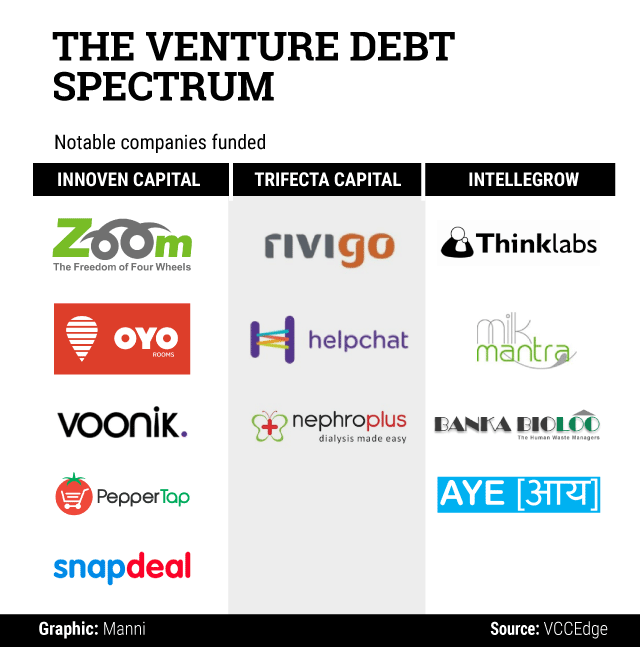 Although venture debt is emerging as an alternative funding option for Indian startups, risks remain. Executives say that the single biggest risk remains the possibility of a sustained slowdown in the VC space. Another risk that lenders face is late payments. Ajay Hattangdi, chief operating officer at InnoVen Capital, says that although defaults remain minimal, creditor rights in India are not protected, which remains a worry. "Having said that, our losses are below 1%," he says.